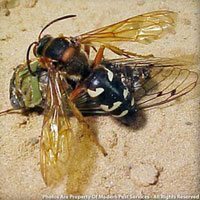 Cicada killers are very large and reach sizes of up to 1 – 9/16 inches or 40mm in length. 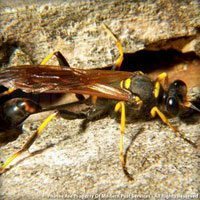 They have a black abdomen with pale yellow markings on the last three abdominal segments. 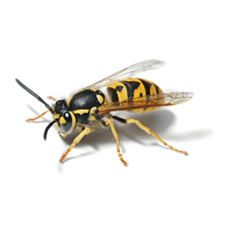 These wasps appear in the early morning and fly over lawns most of the day leaving later in the evening. They generally do not attack people. 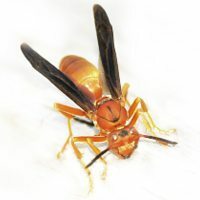 Cicada killer usually feed on beetle grubs in the ground. 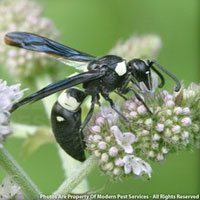 When they find a meal they will sting to paralyze it, then deposit an egg on it. When ready the hatched young will feed on the paralyzed beetle grub. 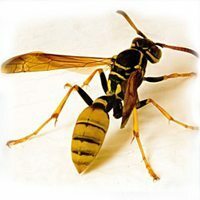 These wasps are solitary. 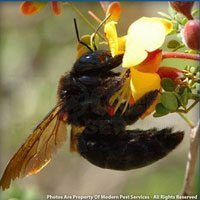 The females build their nests (to which the paralyzed prey is brought) in dry sand where vegetation is sparse.